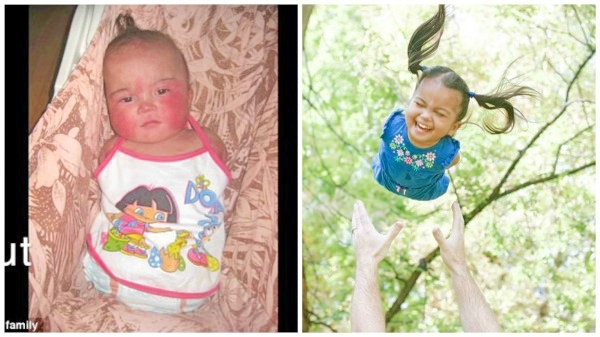 An American family from Utah, United States has decided to take a leap of faith and adopt a Filipina child born without arms and legs. The heartwarming adoption story of Maria Stewart, a three-year-old kid with special needs has touched the hearts of netizens after her adoptive mother, Adrianne shared a home video of her child’s journey. Although Adrianne already had three children, one of which was also adopted from the Philippines, she and her husband decided to get in touch with an adoption agency in the Philippines two years ago. After going through a list of names and photos, the Stewarts knew they had to take a leap of faith and adopt Maria, who was then a 6-month-old girl under the care of Chosen Children Village. But it wasn’t until October 2015 that the family was able to finally meet Maria. During their first meeting, the Stewarts felt an instant connection with the little darling. A year and a half after officially adopting Maria, the Stewarts seemed to have come up with a routine for the newest member of the family. Now, Maria gets to attend preschool twice a week and has monthly sessions with her occupational and speech therapy trainers. Like any other typically developing kid, she gets to play with stuffed animals and listen to her favorite genre, 80’s music. “She has given us far more than we will ever give her. She is so full of joy and light, and is an inspiration to all who meet her. We put limits on her abilities and then we see her doing exactly what we thought she was not capable of. We are so blessed to have her in our family. She has made each of us better,” Adrianne wrote in the caption for the video shared on the popular Facebook page Love What Matters.